In 2020, we're cruising to South Africa! In fact, we're cruising to eleven different African countries in 2020. If you missed the blog post on our exciting South African travel plans, catch up here. In honor of these incredible itineraries, we conducted Q&As with three different Azamara crew members who call African countries home. You can read our Q&A with Liesl from Namibia here, and our Q&A with Philip from Kenya here. Now we're chatting with Almé Morrison, from South Africa. You grew up in South Africa. What part of the country are you from? I grew up near Cape Town. I spent a few weekends during my college years tasting wines, going up the mountains in the Winelands, and swimming with sharks. The main wine region that South Africa is known for is Stellenbosch, 30 minutes outside of Cape Town. One of the big universities is also called Stellenbosch, so when I was studying there and going into the Winelands over the weekend it was part of my studies. I studied tourism and wine was one of the subjects and the one I did the best in. [Laughs.] In Cape Town, visiting the Winelands is a must. When did you join Azamara Club Cruises? I’ve been with Azamara for almost six years now, and I’ve been with Royal Caribbean company for just over 11 years. I was an assistant bar manager and I was itching to become bar manager when a friend told me about an opportunity with Azamara. When I got here for the first time it was a little intimidating, the interaction with the guest. But to tell you, in all honesty, I am in love with the ships, and I love the guests. It’s like a family. I am super excited to share South Africa with guests onboard. What do you think will surprise guests the most about South Africa? People can have misconceptions about what is going on in South Africa. You see all of the stuff in the news that it’s an unsafe place and don’t go there, but all of the guests that I have spoken that have visited independently where so surprised on how safe they felt when they were there. It was nothing like what they expected. Cruising to Africa is a bucket-list vacation and guests will want a memento from the experience. What souvenirs do you recommend they pick up? Besides wine and Amarula (a cream liqueur from South Africa), there is beautiful artwork and beading jewelry. I don’t know if you’ve ever seen these documentaries about South Africa where woman wear different beadings necklaces, but those are available there and they’re beautiful. There is also a lot of handmade wooden bowls, big wooden giraffe statues, and other carvings. Many of the wineries will ship internationally, which is very convenient for guests. Do you have any experience with wildlife in South Africa? There are a lot of place in South Africa to see wildlife. 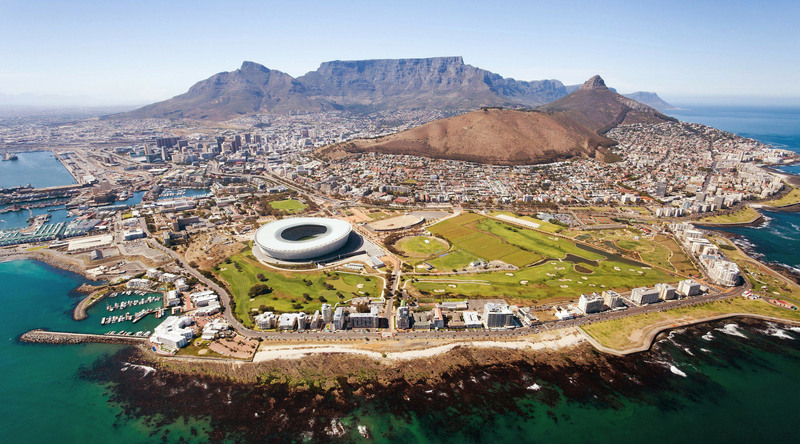 There are some smaller areas that are easily accessible from Cape Town. My favorite animal hands down is the Elephant. I've just always had a fascination with them. They are big, bulky animals, and yet if you go camping and you won’t hear them coming, despite being as big as they are. The only way you'll know elephants were around is when you wake up the next morning and see their prints in the sand. Beyond South Africa, we’re also sailing to several ports in South Africa in 2020, as well as ports in Madagascar, Zanzibar, and Mozambique. If you were booking one of our 2020 Africa itineraries, which of these destinations would you most look forward to? Why? Zanzibar is definitely one of them, it’s one of those idyllic little islands with white beach sand and palm trees. It's also where Freddie Mercury was born. Namibia is one of my favorite places because it’s the most breathtaking countries I’ve seen in my life. It’s a country that is just plain desert and then all of a sudden you have this beautiful town in the middle of a desert, it has everything: sand dunes, deserts, greenery. Anyone can take a trip to Africa, but the opportunity to cruise there with Azamara Club Cruises is brand new. What will make that travel experience special? There are a lot of guests that I have spoken to who know I am from South Africa and they were always asking, "When Azamara was going?" They'll love the convenience of unpacking once and not having to worry how they will get from Point A to Point B, making it easier for them to travel and not having to worry about flights and driving. And the places that the ship is visiting in South Africa are absolutely amazing. In Richards Bay, the beaches are gorgeous! What was your initial reaction when you were told Azamara would be bringing you close to home? I was really really happy. I wish the ships docked in Mossel Bay so that I could bring my family onboard! [Laughs.] But Cape Town is close enough. The ship will actually sail by Mossel Bay so I’ll just tell them to wave. Learn more about our upcoming cruises to South Africa. We hope we'll see you onboard!